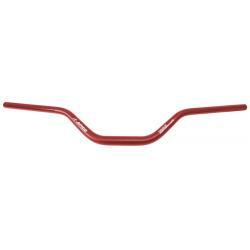 Trial Performance Handlebars 28mm with 5 inch rise (Standard) in a red finish, made by Apico. The new Apico 28mm Trials Handelbars are a very stylish lightweight, anodised handlebar with a sand blasted finish, with highly polished areas for the master cylinder and lever clamps. The handelbars come with a laser etched guide for simple alignment and installation. They also come with laser etched guides to guide you for cutting, if you wish to make the handlebars narrower. UK delivery - Due to the dimensions of this item it will normally be posted by Hermes (2-4 working days), unless part of a larger order, when a courier would be used.